One goal for Hawaiian collectors/numismatists is to promote the hobby. This in-turn increases the number of new Hawaiian collectors/numismatists to pursue this life-long hobby. Garry Moore has accomplished this at the 2016 ANA National Money Show in Dallas by sharing his Hawaiian numismatic knowledge and exhibition prowess. He put the Hawaiian collector/numismatic on the National ANA scene! Won 1st place in the Class 2 Economics category with an exhibit titled: Token Appreciation: The History of the Hawaii School Lunch Tokens. Great accomplishments! Congratulations to Garry on the 2016 National ANA-level wins! 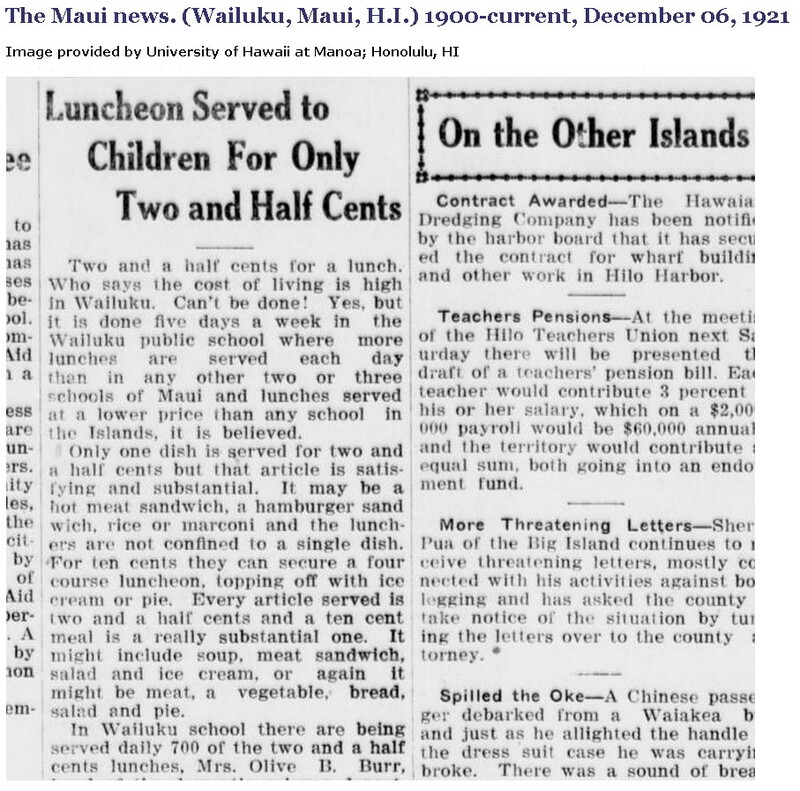 The impetus behind the creation of the lunch school tokens was the rapid malnutrition of the children attending school in the Territory of Hawaii (early 1910s). Department of Health eventually cut funding to feed the malnutrition students. Civic groups stepped in when they could, but was only localized to a specific school and grade level(s). Teachers and other community leaders saw that a well fed student was a student that could learn at his/her full potential. Many of the students were identified as not eating breakfast and/or not bringing a lunch. In some cases, the students would seek unhealthy food from food vendor carts that came to the school. The students who could not afford lunch suffered the most. However, a self-sustaining lunch program was being developed at two schools in 1913. The Normal School was the model. The Normal School set the standard in which lunches were provided to students. A school kitchen was installed. Girls would be taught classes in cooking. Classes would be taught in gardening. Students (under training) created the meals. In fact, the school was showing a profit from its 5 cents a meal lunch program. Several dignitaries visited the school based on this program. Most of the schools began requesting kitchen equipment to aid in the malnutrition problem (and to keep the students with no home provided lunches on school grounds). Based on the school’s curriculum, the cooking classes and gardening classes provided the mechanism to provide meals. As for the school lunch tokens, think of its start as a welfare program instituted by the school for identified students with malnutrition. As a self-sustaining school lunch program arose, those who can pay paid with legal tender. Those who were identified as students with malnutrition where provided free lunch tokens (and most likely performed a school task in exchange for the token, such as cleaning). As the lunch program grew, the lunch tokens were sold to the students at the beginning of the month. This was mostly likely to obtain funds in advance to pay for the food supplies for the oncoming month. But again, the underlying reason for the inception of the school lunch program is that it provided the means to aid low-income students to be fed by providing free school lunch tokens for meals. 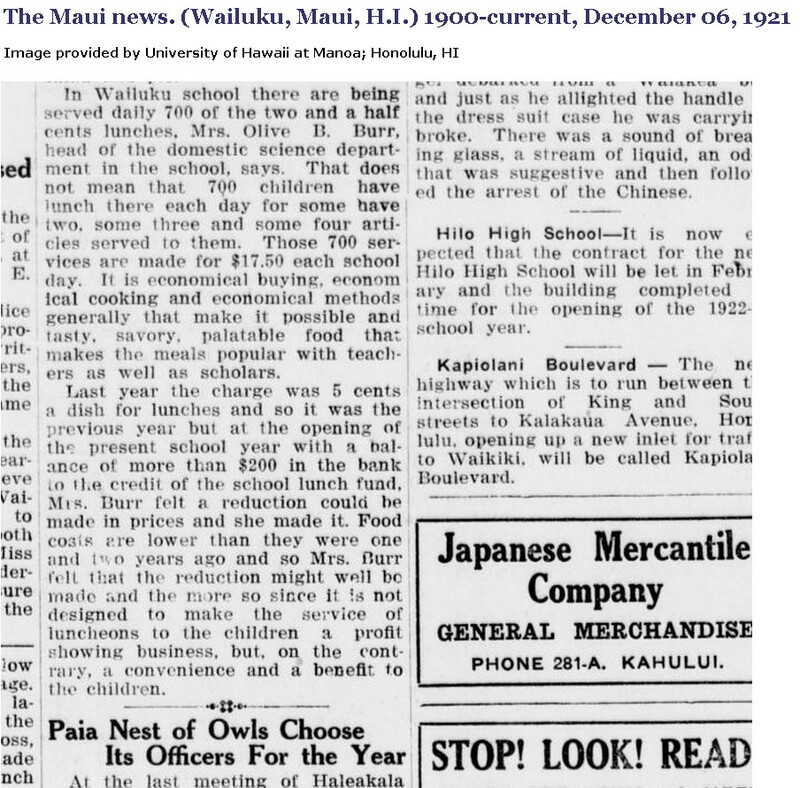 A December 6, 1921 article from The Maui News uncovers a previously undocumented fact about the Hawaii lunch tokens: Reduction in lunch price that changed the wording on the lunch tokens of Hawai’i. Base on this newspaper article, a single served lunch was originally priced at 5 cents for years. As the school lunch program were fully funded (by the local community), the school dropped prices (and switched to sell by entrée format) as they were a not-for-profit business entity. There are several articles in which the school asks for donations from the local community. In addition, for the students who could afford it, a 10 cent meal was available (four 2.5¢ entrées as a meal). Wailuku School 2TL-123 and 2TL-124 are prime examples of this drop in price and change in wording on the tokens. It was requested that I start to investigate and uncover more information about the lunch tokens of Hawai’i. 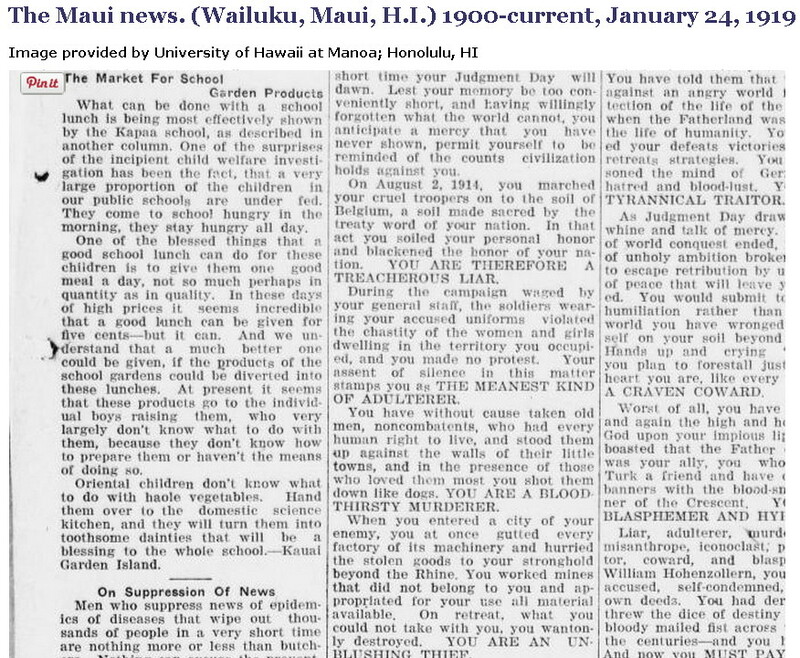 After a few clicks this is my first find, a 1919 news article from The Maui News (Wailuki, Maui, T.H.) about the free lunch school program on the island of Kauai. The Kapaa School (Kauai) is mentioned and the price of lunch was 5 cents. The school, price, and location correlates with M&R 2TL-49, 2TL-50, 2TL-50a, and 2TL-50b. The 1919 year is just a date of when the free lunch program was documented as being active and not when the tokens were being used, but it provides a good start. 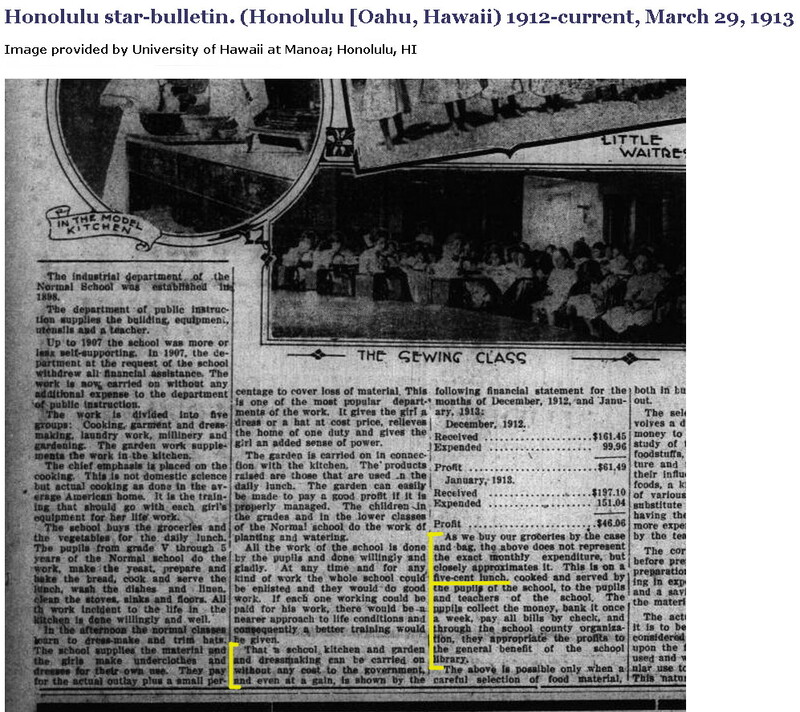 The article is in the left column (click to enlarge).